Steve @ Atcherley.org.uk 9 July 2015 27 January 2019 No Comments on Was Margaret Atcherley’s son transported to Australia? In 1843 a man by the name of Charles Needham was sentenced, at Sheffield, Yorkshire, to seven years transportation. He was sent ‘Down Under’ on the Equestrian, which departed England on 25 January 1844. Charles arrived at Van Diemen’s Land (Tasmania) later that year and eventually obtained a ticket of leave at Hobart, meaning that he was free to settle in Australia or return home. A number of online family trees say that this Charles was the son of Thomas Needham and his wife, Margaret Ann, nee Atcherley. But was that really the case? According to an entry dated 29 November 1797 in the parish register of Kinnerley in Shropshire, Margaret Ann Atcherley [ ] was the “Daughter of John Atcherley and Anna Meria his wife Formerley howell”. The register also recorded that Margaret was born on 6 October that year, that her family’s abode was Edgerley (a township in Kinnerley parish), and that her father was a “Freehoulder”. 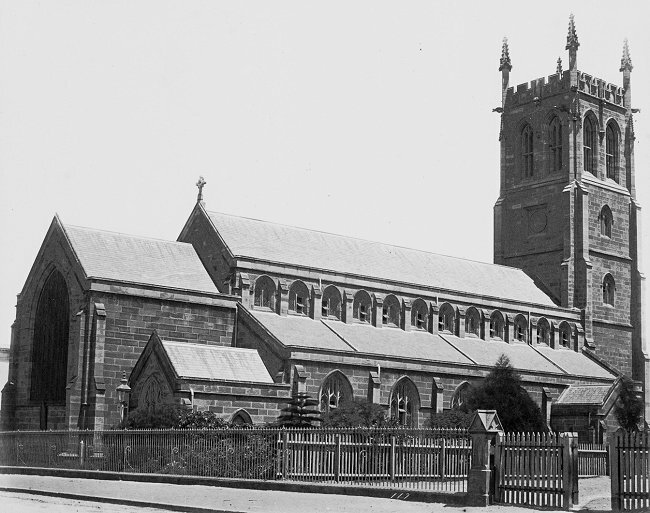 Some 26 years later on 6 January 1824, at the church of St Oswald in Oswestry (pictured right), Margaret Atcherley – who was living in that parish – married Thomas Needham [ ], of Whitford (near Holywell, in Flintshire, Wales). Thomas was a native of Whitford and was baptised there on 16 May 1802. The marriage of Thomas and Margaret was by licence rather than by banns, and both bride and groom signed the register. Both had therefore come from families which had the means to pay for the education their children, and Thomas could afford the higher cost of a marriage by licence. Yet he had an occupation which I would not normally associate with his apparent status. Thomas and Margaret’s first two children, Mary Anne [ ] and Jane [ ], were baptised in north-east Wales in 1825 and 1827 (at Wrexham and Holywell respectively). In both case, the baptism registers showed that Thomas was a miner. Looking at old maps for the abodes of the Needham family as recorded in the registers (“Pantywyll” – actually Pant-tywyll in Minera township – and Brynford) reveals that there were lead mines close by. Charles [ ] — the Son — of Thomas Needham of Jenkinson Street in the Parish of Manchester in the County of Lancaster Gardener — and of Margaret — his wife, who was the daughter of John and Hannah Atcherley was born on the Sixteenth — day of September in the year of our Lord one thousand eight hundred and — thirty — And was solemnly baptized with water, in the name of the Father, of the Son, and of the Holy Ghost, on the tenth day of October in the year of our Lord one thousand eight hundred and thirty by me Humphrey Jones. Jenkinson Street was situated in Chorlton upon Medlock, in the south-eastern part of the city, borough and parish of Manchester. Exactly what it was that drew the Needham family to that city is beyond me. However they were still there in 1836, and Thomas was still working as a gardener, when the last addition to the family – Elizabeth [ ] – was baptised on 31 December at Rusholme Road Chapel. She had been born three months earlier on 27 September. When the census of 1841 was taken, Thomas, Margaret and their four children were back in Holywell parish, Flintshire, this time in the township of Greenfield. No occupation was recorded for Thomas, but the family’s address was Parish Mine Road. Their neighbours included a copper chipper, a copper refiner, labourers and two forgemen. It seems logical to assume that Thomas was there to work in the local copper mine. His return to his usual field of employment did not however mean an end to his family’s travels – at least not yet. A more settled existence for Thomas and Margaret Needham began sometime between 1841 and 1851, when they moved to Maesydre (or Maes-y-dre) just outside the town of Mold. They were recorded in this town – situated midway between Holywell and Wrexham – on the 1851 census, and it should come as no surprise to find that Thomas was working as a lead miner. I suspect he and Margaret were still there at the time of the 1861 census too. However it appears that some of the pages from the end of Mold district 3 have not survived, and I think the Needham household was among those in Maes-y-dre which were on the missing pages. Neither Thomas nor Margaret made it to the next census – both died in 1865. Margaret was buried at St Mary’s church in Mold on 25 January, her age given as 71 (she was in fact 67). Thomas joined his wife on 31 August, his age given as 65. The burial register recorded the abode for both as Maesydre. I have tracked the fortunes of Thomas and Margaret Needham’s children with varying degrees of success. Mary Anne and Jane seem to disappear from the records after the 1841 census, with no death, burial, marriage of later census records which I can link to them with certainty. Elizabeth, the only child of Thomas and Margaret who was still with them when the 1851 census was taken, married Humphrey Jones in 1865 and had at least four children with him by 1881 (that year’s census being the last trace I have found of her and her family). Like his older sisters, Charles Needham fails to turn up on any census taken after 1841, as far as I can tell. He does however show up in Australian records. On 3 April 1854 Charles married the widowed Susanna Ennis (née Pate) [ ] at St Phillip’s Church in Sydney (pictured above). Susanna was born in that city in 1835, and her first marriage, to Joseph Ennis, had taken place at St Phillip’s in 1851. Sydney was most likely also the birthplace of Charles and Susanna’s first child, Charles William Joseph Needham, his birth being registered in New South Wales in 1855. At some point over the next two years, Charles and Susanna relocated to the state of Victoria – the death of their infant son was registered there in 1857. Later that same year (on 2 August) Susanna gave birth to a baby girl, Elizabeth, at White Hills on the outskirts of Bendigo. I can only describe Elizabeth’s entry in the register of births as a mine of information. It confirms amongst other things that her father, 28-year-old Charles Needham, born in Manchester, England, was – like his father before him – a miner. While Thomas Needham had extracted lead and copper, in Australia Charles was mining for gold. This precious metal had been discovered at Bendigo Creek in 1851, sparking a gold rush and fuelling the growth of the mining settlement. Gold was also found elsewhere in Victoria during the 1850s, including Pleasant Creek where the town of Stawell was established. Charles and Susanna had moved to this area by 1864, when the birth of their fifth child, Susan Emma Needham, was registered. The births of five more children were registered at Pleasant Creek from 1866 to 1878, during which time the town of Stawell continued to grow. I know very little about the remainder of Charles’s life in Australia, besides the details of his death. Charles Needham passed away on 3 May 1903 at Moonee Ponds, Victoria. He was 72. His widow Susanna died in Darlinghurst on 2 June 1907 (death notices for both Charles and Susanna are shown above). The question of how Charles Needham’s life in Australia began needs addressing however. Was he transported as a convict? I think not. The Charles Needham who was convicted at the Sheffield Quarter Sessions of 7 September 1843 was aged 26, and was therefore born around 1817. He was, I suspect, the Charles Needham born in 1817 and baptised 1821 in Sheffield, son of Charles Needham, a scissorsmith, and his wife Harriet. I would guess he was also the Charles Needham, cutler, shown on the 1841 census living with William Needham (also a cutler, and presumably Charles’ brother) in the Sheffield home of John Judge (yet another cutler). Charles’s age was recorded as 20, but adult ages were usually rounded down to the nearest 5 years on this census. It seems that his work with Sheffield steel led to a case of Sheffield steal, as he was found “Guilty of stealing six dozens of table blades, at Sheffield”. He was almost certainly the 40 year old Charles Needham, a labourer, who died on 5 Apr 1858 in the district of Launceston, Tasmania. So how and when did Charles Needham, son of Thomas Needham and Margaret Ann Atcherley, arrive in Australia? I don’t yet know when, but I think I know how. I have recently discovered that Charles was ‘ticketed’ as a merchant seaman on 8 August 1846, aged 16. His complexion was fair, his eyes dark brown, and he had a cut to the side of his left eye. As for his height, this was noted as “growing”! Charles first went to sea as an apprentice during 1846. I think it is very likely that it was as a seaman that Charles arrived in Australia. I am certain he was not transported – and I say that, if you will pardon the pun, with some conviction. Postscript: Another record relating to Charles Needham’s merchant navy apprenticeship has come to light. An entry for Charles in a register of Apprentices’ Indentures, bearing his Register Ticket number (337,687), shows that on 8 August 1846 he was bound to Robert Allen of Londonderry for four years, to serve aboard the Clydesdale. However, it appears that Charles did not complete his apprenticeship. He was one of many young apprentices recorded as having “deserted”, and the note in red above his name shows that he deserted at Quebec! Having ‘jumped ship’ he presumably found alternative employment and worked his passage to Australia. What an adventure! Picture credits. 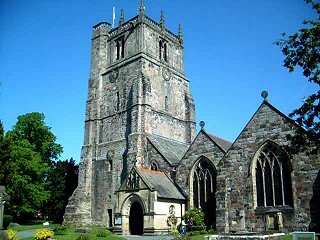 Oswestry St Oswald: Photo by Alan Myers, taken from his Flickr photostream, adapted and used under a Creative Commons licence. St Phillip’s Church, Sydney, New South Wales: Public domain photo from the collections of the State Library of NSW, taken from Wikimedia Commons. Charles and Susanna Needham, death notices: Composite image from copies of the Sydney Morning Herald published before 1954 and therefore out of copyright; taken from Trove (National Library of Australia) (see Trove’s Using digitised newspapers FAQ). Convict Transportation Registers (The National Archives, Kew, Class HO 11, Piece 14, folios 2 (recto) and 9 (recto). Copies viewed at Ancestry – Australian Convict Transportation Registers – Other Fleets & Ships, 1791-1868. Settlers and Convicts, New South Wales and Tasmania (The National Archives, Kew, Class HO 10, Piece 38, Folio 446 (recto) and Piece 40, Folio 344 (verso)). Copies viewed at Ancestry – New South Wales and Tasmania, Australia Convict Musters, 1806-1849. Kinnerley, Shropshire, parish register covering 1797. Entry for baptism of Magt Ann Atcherley. Copy viewed at Findmypast – Shropshire Baptisms. Abstract in Shropshire Parish Register Society (1913), Shropshire Parish Registers, Diocese of St Asaph, volume III (Kinnerley, Page 246); copies viewed at Internet Archive and Mel Lockie’s website. Indexed at FamilySearch, Batch P01544-1, Film 908230. St Oswald, Oswestry, Shropshire, marriage register covering 1824. Entry for Thomas Needham and Margaret Atcherley. Copies viewed at Shropshire Archives and at Findmypast – Shropshire Marriages. Indexed at FamilySearch, Batch I03560-6, Film 1657589, Ref ID item 6 p 199. St Beuno & St Mary, Whitford, Flintshire, baptism register covering 1802. Entry for Thomas Needham, son of Thomas and Mary Needham, abode Uwch Glan. Information provided by Rootschat user Paul. Marriage licence. At: Wikipedia (website, accessed 5 Jul 2015). Wrexham, Denbighshire, baptism register covering 1825. Entry dated 20 November for Mary Anne Needham. Copy viewed at Findmypast – Denbigh Baptisms. Holywell, Flintshire, baptism register covering 1827. Entry dated 9 November for Jane Needham. Copy viewed at Findmypast – Flint Baptisms. Ordnance Survey (1879), six-inch map series, Denbighshire Sheet XXVIII. (Pant-tywyll appears below the ‘a’ of ‘Minera’ and to the north of the Minera Lead Mines.) Copy viewed at National Library of Scotland website. Ordnance Survey (1878), six-inch map series, Flintshire Sheet VI. Copy viewed at National Library of Scotland website. St David’s Wesleyan Church, Parliament Street, Manchester, baptism register covering 1830. Entry for Charles Needham. Copy viewed at Ancestry – England & Wales, Non-Conformist and Non-Parochial Registers, 1567-1970. Indexed at FamilySearch, Batch C08934-1, Film 0560888 (RG4 1145). Rusholme Road Chapel, Chorlton on Medlock, Manchester, baptism register covering 1836. Entry for Elizabeth Needham. (The National Archives, Kew, item RG4/813, folio 16 (verso).) Copy viewed at Ancestry – England & Wales, Non-Conformist and Non-Parochial Registers, 1567-1970. Indexed at FamilySearch, Batch C08820-1, Film 0560879 (RG4 813). 1841 census of England and Wales. Piece 1413, book 5, folio 57, page 24. Parish Mine Row, Greenfield, Holywell, Flintshire, Wales. Thomas Needham, 40, [no occupation given] born in county. Margaret Needham, 45, not born in county. Mary Needham, 15, born in county. Jane Needham, 13, born in county. Charles Needham, 10, not born in county. Elizabeth Needham, 4, not born in county. 1851 census of England and Wales. Piece 2501, folio 599, page 42. Maesydre, Mold, Flintshire, Wales. Head: Thomas Needham, 50, lead miner, born Whitford. Wife: Margaret A Needham, 54, born Kinnerley, Shropshire. Dau: Elizabeth Needham, 15, born Manchester, Lancashire. Ordnance Survey (1878), six-inch map series, Flintshire Sheet XIII. (Maes-y-dre shown just north of Mold.) Copy viewed at National Library of Scotland website. Death of Margaret Needham registered at Holywell, March quarter 1865; volume 11b, page 233. St Mary, Mold, Flintshire, burial register covering 1865. Entry for Margaret Needham. Copy viewed at Findmypast – Flintshire Burials. Death of Thomas Needham registered at Holywell, September quarter 1865; volume 11b, page 193. St Mary, Mold, Flintshire, burial register covering 1865. Entry for Thomas Needham. Copy viewed at Findmypast – Flintshire Burials. St Mary, Mold, Flintshire, marriage register. Entry dated 15 Oct 1865 for Humphrey Jones, 25, Bachelor, Collier, and Elizabeth Needham, 28, Spinster, father Thomas Needham, Miner. 1871 census of England and Wales. Piece 5646, folio 73, page 46. 66 Maes Dre, Mold, Flintshire. Head: Humphrey Jones, 31, collier, born Mold. Wife: Elizabeth Jones, 32, collier’s wife, born Manchester [Lancashire]. Dau: Margaret Jane Jones, 4, born Mold. Dau: Charlotte Jones, 2, born Mold. Dau: Catherine Jones, 7 months, born Mold. 1881 census of England and Wales. Piece 5507, folio 106, pages 39 and 40. 16 Cileen Road, Mold, Flintshire. Head: Humphrey Jones, 44, coal miner, born [Rho___r ?]. Wife: Elizabeth Jones, 43, born City of Manchester [Lancashire]. Dau: Charlotte Jones, 13, born Mold. Dau: Eliza Jones, 9, born Mold. New South Wales marriage registration number 18/1854 V185418 41B. Charles Needham and Sussana Ennis. District CA. Found via search at New South Wales Registry of Births, Deaths and Marriages website. Early church codes. At: New South Wales Registry of Births, Deaths and Marriages website (accessed 9 Jul 2015). New South Wales birth registration number 2276/1855 V18552276 42A. Charles W Needham, parents Charles and Susan. Found via search at New South Wales Registry of Births, Deaths and Marriages website. Victoria, Australia death registration 2248 of 1857. Charles William Needham, age 1. Parents Charles and Susan. Source: Ancestry – Australia Death Index, 1787-1985. Victoria, Australia birth registrations 12490 of 1857 (Elizabeth Needham, at Maryborough); 4294 of 1860 (William Henry Needham), 10028 of 1863 (Emily Needham, at Redbank); 24014 of 1864 (Susan Emma Needham, at Pleasant Creek); 23356 of 1866 (Reuben Thomas Needham, at Pleasant Creek); 25484 of 1868 (Charles George Needham, at Pleasant Creek); 18678 of 1871 (Cecilia Eleanor Needham, at Stawell); 11170 of 1874 (Evelyn Atcherley Needham, at Pleasant Creek); 4557 of 1879 (Sydney Manchester Stawell Needham, at Pleasant Creek); parents Charles Needham and Susan/Susannah Pate/Ennis. Source: Ancestry – Australia Birth Index, 1788-1922. Victoria, Australia birth register entry for Elizabeth Needham, born August 2nd 1857 at White Hills. Copy downloaded from Victoria Births, Deaths and Marriages website. Bendigo. At: Wikipedia (website, accessed 5 Jul 2015). The Early Days of Stawell. Originally at Stawell Historical Society website (accessed 5 Jul 2015); link now directs to archived version at Internet Archive Wayback Machine. Stawell, Victoria. At: Wikipedia (website, accessed 9 Jul 2015). Victoria, Australia birth register entry for Evelyn Atcherley Needham, born April 10th 1874 at Borough of Stawell. Copy downloaded from Victoria Births, Deaths and Marriages website. The Official Post Office Directory of Victoria. 1869. Page 572. Copy viewed at Google Books. The Argus (Melbourne), 4 Apr 1878, page 5. Copy viewed at Trove. Victoria, Australia death registration 5533 of 1903. Chas Needham, age 72, mother’s name Atcherly, at Esdon. Parents Charles and Susan. Source: Ancestry – Australia Death Index, 1787-1985. Sydney Morning Herald, 5 May 1903, page 4. Deaths. Copy viewed at Trove. New South Wales, Australia death registration 3678 of 1907. Susanna Needham, age parents Reuben and Mary. Parents Charles and Susan. Source: Ancestry – Australia Death Index, 1787-1985. Sydney Morning Herald, 3 Jun 1907, page 6. Deaths. Copy viewed at Trove. Criminal Registers, England and Wales (The National Archives, Kew, Class HO 27, Piece 71, Folios 508 (verso) and 509 (recto)). Copies viewed at Ancestry – England & Wales, Criminal Registers, 1791-1892. Sheffield Independent, 9 Sep 1843, page 4. Midsummer Sessions. Copy viewed at Findmypast. St Peter & St Paul, Sheffield, Yorkshire, baptism register covering 1821. Entry for Charles Needham. Transcript by Sheffield & District Family History Society viewed at Findmypast – Sheffield Baptisms. 1841 census of England and Wales. Piece 1335, book 14, folio 41, page 5. Matthew Street, Sheffield, Yorkshire. Register of Deaths in Launceston & Country Districts, 1858, entry number 400. Copy viewed at Linc Tasmania website. Registry of Shipping and Seamen: Register of Seamen’s Tickets (The National Archives, Kew, Class BT 113, Piece 169, no. 337,687). Copy viewed at Findmypast – Merchant Navy Seamen. Registry of Shipping and Seamen: Index of Apprentices (The National Archives, Kew, Class BT 150, Piece 22). Copy viewed at Ancestry – UK, Apprentices Indentured in Merchant Navy, 1824-1910.